Once upon a time, Branden Powers had a dream. In his dream a pirate stole an enchanted golden tiki from a volcanic island inhabited by mermaids and Cyclops. 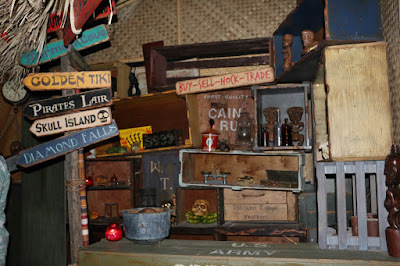 Powers opened The Golden Tiki bar, his long time dream, Friday night after a party by invitation only. 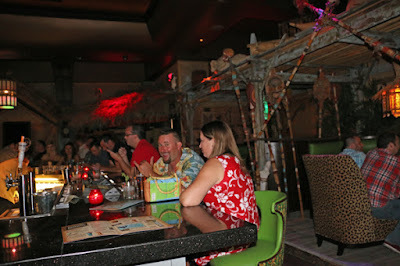 The bar displays exoticism, reflecting the exotic side of Branden. 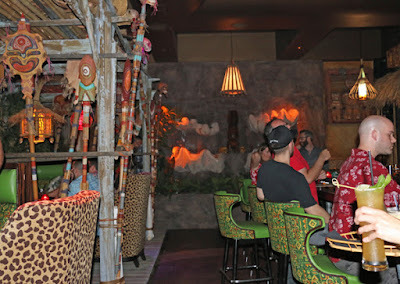 However, Golden Tiki is not just an exotic–themed bar, its an over the top tiki room experience on steroids. Entering it is like entering a huge cave inside a pirate island. 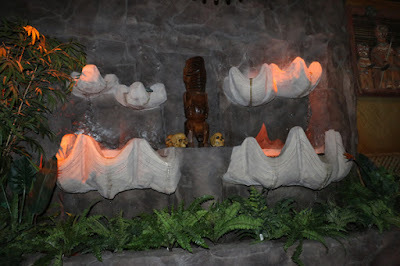 There are many themed areas in the bar: Headhunter Village, Mermaid Cove, Pirates’ Lair, the Golden Tiki lounge and a waterfall made up by sea shells fountains. 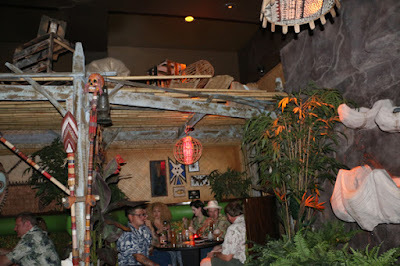 The Pirate's Lair is a cozy dimly lighted lounge with surrounding couches, where every 45 minutes a pirate skull sings, dances and stares at people sitting with its glittering red eyes. The night's drink champion was "Golden Tiki", the signature tiki cocktail. Its base is Jamaican Rum and Michters rye; they are blended with Apricot Liquor, ginger, mango and five spice syrup. Another champion was Banana Batida, a Brazilian cocktail, mixed with Avuá Cachaça, banana liquor, coconut cream and Dole pineapple whip, blended, and topped with grated nutmeg. While you enjoy the feature drinks, DJ Rex Dart delivers hot and sultry lounge music that slowly takes you to a perfect climate that matches the magical surroundings. Rex creates a cool ambiance, and as the party gets hot, he turns the music "temperature" up. Golden Tiki is already a huge success. 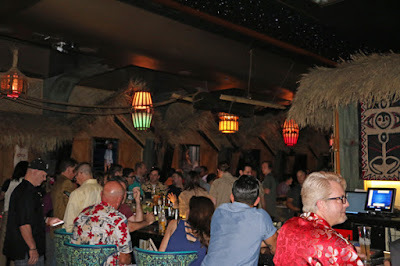 There is something that draws people to The Golden Tiki like a magnet. As I was outside taking pictures of the bar's facade I witnessed many people trying to get inside "just to take a pic" "just for a sec". Branden pursued his wildest dream and made ​​it come true. He has now turned a legend into reality. They hand make the bar own syrups, use top shelf booze and offer it at a few dollars more than local dive bars. Standard drinks (non tiki ) are $6, $8 and all tiki drinks are $11 without the mug to take home. Bea, you're a legend !